View More In Hunting Knives - Page 2. 726M Foldable knife has a good combination of small sizes with high practicality and universality. Producers managed to achieve this through the use of a folding structure and quality material. The knife blade made of ultralight folding knife has 440C steel with 58 units of hardness. Excellent quality of small folding knife combines such important qualities corrosion resistance with low hardness material. Camping folding knife is not overheated under the sun and overcooled in the cold. There are knurled straps on the Folding Knife handle to prevent from slipping out of the wet palms and and there is a clip-pin on the handle to fasten the knife to the pocket. BLADE - Combination of corrosion resistance with 58 units of hardness (58-60HRC) of High Quality 440C Stainless Steel Folding Knife is perfect for Tourist, Hunting and Camping knives. 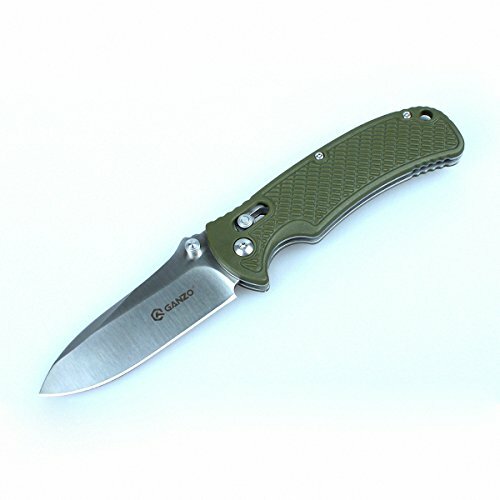 HANDLE - Folding pocket knife green G10 made of durable stainless steel, on both sides and high-quality fiberglass nylon. ERGONOMIC DESIGN - The Folding Knife Handle has comfortable straps that prevent slipping hands by the handle and a secure clip for fastening the folding knife in your pocket. BLADE LENGHT - Very compact and lightweight sharp Foldable Knife. Its folded length is only 4.2in decomposed state 7.5in with a blade length of 3.4in and a weight of only 4.2 Oz. UNIVERSAL - Survival knife folding does not overheat in the sun and supercooled in the cold, thanks to the unique smooth sharpening which is suitable for work with a lot of different materials. If you have any questions about this product by Ganzo, contact us by completing and submitting the form below. If you are looking for a specif part number, please include it with your message.